Last year I wrote a recap of my 2015, looking at both the wins and challenges throughout the year. From depression to a job change to a few off-the-grid vacations to being laid off and starting my own company and being more-than-able to pay my part of our bills in San Francisco, 2015 was a crazy year. 2016 was no different. This was a year of personal ups and downs, as well as some of the greatest highs I’ve ever experienced. I saw more of the world than I’ve ever seen before, and learned more than I ever thought I would. This recap is going to focus on the big trends underscoring my life in 2016 and then look ahead to 2017. At the end of 2017, I want to look back and grade myself, recapping the year and then looking forward to the next year (assuming Donald Trump hasn’t killed us all in a nuclear armageddon). 2016 started off much the same as 2015 – with me having a hard time personally. I was stressed out by everything required to build my business, grinding hard consulting to pay the bills, not getting enough exercise, and was generally unhappy. When I decided to work for myself, I knew that I was not setting myself up for the easy path – bootstrapping a software company in the most expensive city in the United States (San Francisco) surrounded by people who always seemed to be “killing it” and raising a ton of money to help them grow their business faster. Even though the funding environment started to implode in 2015 and funding only got harder for startups in 2016 (and many of them had to actually focus on building a real business and achieving profitability while they weaned themselves off VC money), the SF environment worships VC funding and ignores boots trappers. All this together, I was in a bad place. Started seeing an EMDR (I’ll write about that some other time maybe) therapist/specialist named Jayn in late January and met with her almost every week until mid-October. Through our 50-minute sessions, I was able to work through a ton of things from my childhood and background as well as things left over from my previous job. Saw a physical therapist for a few months in February/March. I’ve lived an active lifestyle of extreme sports pretty much my whole life, and because of that my body felt much older than my current 32 years of age. Through seeing this PT I was able to finally get to the root of my gait and back issues, which has led to me being able to start running again and enables me to climb, cycle, ski, and more relatively pain-free other than the natural soreness that comes with these sports. Began meditating. While I don’t do this nearly every day, I have completed a month’s worth of days using Headspace, which is a freemium app (I’m on iOS) with guided 10-minute meditations. At the height of my stress back in April (multiple consulting clients, two weeks traveling, and working on a business pivot), these daily meditations centered me and allowed me to take steps back in the middle of the day to refocus. Started taking a mood-balancing over-the-counter (or Amazon Prime) supplement called SAM-e. I’ve always been an up-and-down person prone to fairly quick mood swings that I have never understood. Oftentimes it has been from hunger or thirst (I discovered this year that I am mildly hypoglycemic, which contributes to these swings), but other times it was unexplainable. Instead of seeing a doctor and being prescribed antidepressants (I have nothing against antidepressants, to be clear, as many in my family are on them, but it was not the first route I wanted to take), I decided to try SAM-e at the recommendation of my doctor sister-in-law. Just 400mg taken every morning has leveled out my moods, and I’ve been much more stable throughout the day. Interestingly, I have also noticed that within an hour or so of taking it I am less creative, so I’ve actually used this to my advantage where I will try to do creative work (such as writing) early in the morning and then have a late breakfast around 10am and take it. Began taking off one afternoon per week (at least) to do something other than work. This was at the recommendation of my therapist who works with a lot of startup founders in the Bay Area. She encouraged me to plan one afternoon each week (and discouraged me from doing it on the afternoons where we had our sessions) to go do something I love that was outside of work – rock climbing, cycling, holing up in a coffee shop just to read, whatever. I found that the weeks I did this consistently were some of the happiest and most productive weeks I had all year. I highly recommend it. Cut back on caffeine for most of the year. With starting your own company comes a lot of anxiety, and in February or so of this year I started experiencing panic attacks. It felt like the world was closing in and I had trouble breathing. These would also happen at incredibly random times, such as sitting on the couch with my wife asleep next to me while I watched an episode of a TV show or a movie. I decided to cut back from my four or so cups of coffee a day to just one, and this has done wonders for my levels of anxiety. I no longer always feel like I am amped and ready to go to battle at any time. Instead this combined with meditation and SAM-e has made 2016 one of my most relaxed ever. Beginning a weightlifting routine again. My wife and I rock climb once or twice a week, which we will keep up, and afterwards we do 3-4 sets of pushups and then I do pull-ups to exhaustion (usually takes 15-20 these days). I have always been more of a fast-twitch (bulk) muscle person than a long twitch (aka what all endurance athletes have primarily), going back to college when I would lift 3-4 days a week and went from a skinny 136 pounds on my 5’9” frame to a cut 180 pounds. I don’t want to get back all that bulk as rock climbing and skiing are best done while as lean and strong as possible, but I do want to get stronger again now that my back and knee issues are worked through. Finding a few events to do where I need to train to accomplish them. Two years ago we did the Levi’s Gran Fondo, a 103 mile and 9,000 feet of elevation climbing test of endurance in Sonoma County, California. We trained with our friends through the spring, summer, and early fall to get in shape. Even with a few weeks off right before in Europe we were able to accomplish our goal of finishing and I came to realize that I am motivated to exercise when I am training for something (similar to business for me, actually). So while I do not have anything concrete planned yet, this is a priority for me this coming year. 2016 unexpectedly turned out to be the year of friends. Part of this is due to the hard personal work I did with my therapist (more on that in the next section), but this was the year where I more fully came to value business relationships and going deep with a few, as opposed to spreading my net as wide as possible. I have always had a wide group of acquaintances, priding myself on being able to get along with most people. In 2016 I decided that while I should continue being cordial and helpful to as many people as possible, I needed to focus down on relationships that have been long-lasting. Prioritized frequent and consistent communication with a few friends who are in other cities. These friendships started initially as business relationships, but they have become some of my most valued relationships over the last five or six years. Made it a point to see people face to face as much as possible. I was fortunate to meet a few great founders and smart tech-related people in San Francisco, so I wanted to take advantage of the size constraints of the city and see them face to face. While I still do not feel like I saw them as often as I would have liked, these friendships mean a lot to me and have continued to blossom even as we moved and were traveling for months on end. Went deep with some agency owners (see: CredoCamp). A few of the pros on Credo have become some of my closest professional friends over the last year. While they are still not nearly as deep as the few mentioned in the first bullet of this section, these relationships have been incredibly fortuitous on both sides. In 2017 I am going to take this to a whole new level. I plan to invest in our new city of Denver and try to bring together great people to share knowledge and keep each other accountable. I’m also teaming up with a few other entrepreneurs in the digital marketing space to do this virtually. I’m excited for the relationships and growth that will come through this. One of the most groundbreaking concepts I came across this year came from my therapist Jayn, which she called “smart vs wise”. Sometimes we’d talk about how I felt stuck from time to time. Not sure which direction to go with business, not sure how to solve a certain problem I was facing whether personal of business-related. One day she said “remember the smart vs wise concept”. We hadn’t talked about this before, so I asked her to explain. Jayn explained that she sees a lot of intelligent people (she lumped me in there) who have gotten to where they are simply by being smart. They’re good problem solvers and hard workers, so if they apply enough mental energy and hard work to a problem they are often able to figure it out quite well. And this works to a certain point. But at some point you realize that you are constantly reinventing the wheel and instead should be looking to maximize your time and effort by learning from those who have gone before you, whether a mentor or just an entrepreneur you’ve never met in person but look up to. Jayn encouraged me to stop being “smart” and instead to start being “wise”, learning from others. This has been life-altering for me. I’ve started learning from others who have done things that I am currently doing for the first time and then looking to think deeply about the concepts (a sign of a great teacher is that they teach concepts, not tactics) they share and how I can then apply them to my own business. Not every concept is a fit right now, but I have come across a few major ones that have changed my business for the better. By connecting with others on a deeper level and being open to learning from others, my business went from potentially failing back in March (I had 3 months of consecutive software revenue decline) to growing 4x from May to December even as I closed down the revenue engine for two full months. And through this my consulting has also grown revenue-wise while not taking up more of my time, as I am working on the projects and strategies that provide the most value to my clients. 2017 was a crazy year of travel. I’ve definitely felt like I’ve lived on airplanes this year and I am incredibly comfortable working from anywhere as I have a few spare hours of time. I am just as at home working from a coffee shop in Costa Rica or a hotel in New York City as I am from my own couch/home office. Travel allowed me to see the world this year and really opened up my eyes to opportunities abroad as well allowing me a test of the travelpreneur/4HWW lifestyle. It also has made me realize my own limitations and now I am thinking about how I take my business to the next level in 2017 by outsourcing some things to virtual assistants overseas and expending cash to get back time and headspace. Going to MozCon in Seattle if I hit my goal of $100k annual recurring revenue (ARR) ($8,333 a month recurring revenue). I was a bit short when I decided to book the ticket and flights, and ironically hit the goal the first morning of MozCon. Buy myself a watch I wanted (not super expensive, but nice) and go to a fantastic prix-fixe meal at a very nice restaurant in San Francisco (The Progress) when I hit $10k monthly recurring revenue (MRR). So far in 2017, I only have one major milestone so far that I plan to celebrate, which is attending MicroConf and the growth track in Vegas in April, and buying those tickets when I hit $15k ARR. The target date for buying these is mid-February. As far as investing in other areas, I am in a weird place when it comes to procuring new knowledge. Most of the courses out there offered by people I look up to (Ramit Sethi with Earn1k, The Foundation, etc) in the software world are focused at people just getting started and looking to make their first $1000 online on the side. But I already have a revenue-driving machine and now I am looking to take it to the next level. I’ve decided in 2017 that I am not going to focus on learning more about business models or software platforms any more than is needed. All of this information is out there on the Internet if you know where to look, so I can find it there. 2017 is going to be the year where I invest in myself as an entrepreneur and business owner. I know that I have my own limitations as it relates to management and growing a business, so these are the areas that I am looking to invest in for 2017. I don’t know yet what form it will take, though I suspect it will be some combination of mentorship (paid and unpaid), trying to go to exclusive private entrepreneur events with accomplished entrepreneurs, and more. I’m setting aside a budget that is specifically earmarked for these purposes, so now I’m looking into how to spend that money wisely. For the first nine months of this year, my wife and I lived in San Francisco. Now we’ve relocated to Denver, Colorado and are settling into our house there starting tomorrow (January 1, 2017). So Denver is brand new to us as a permanent location. One of my focuses for 2017 is to be get involved in the local ecosystem and both invest my time and knowledge as well as soaking up all the knowledge and friendship I can. I felt like I did this way better in San Francisco in 2016 than I had in the two years before combined and it added so much to my life that I plan to prioritize this in Denver. And honestly, I think it will be a bit easier as people in Denver tend to be a lot more open to hanging out and discussing life. People are less busy “crushing it” and instead jive with my mentality of “work hard and enjoy your life.” Of course I enjoy what I do, but as you can tell from the first section of this recap I have also relearned the value of disconnected time away from devices and Internet. There are many forms that this will likely take, and I look forward to figuring out which ones are best worth my time and energy. Going back to the friendships lesson learned in 2016 I want to go deep instead of broad, though at the beginning it is often necessary to go broad to know where you should go deep. 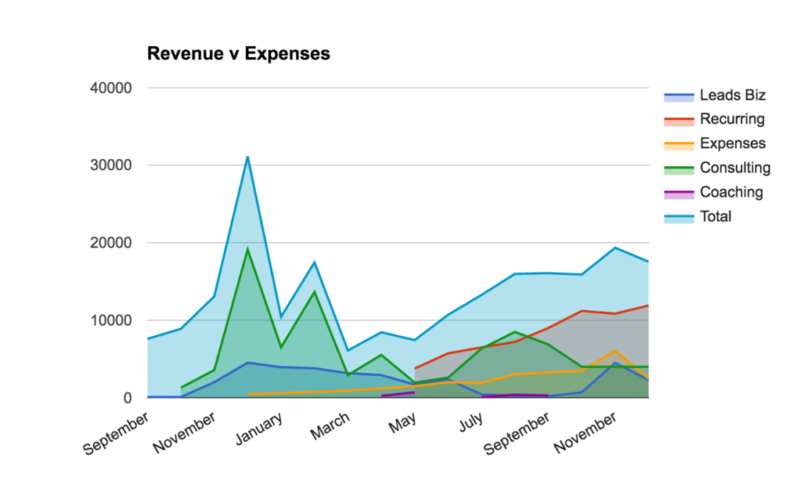 One of the things I am most proud of is that operating expenses did not rise nearly as fast as revenue overall, and since my goal is eventually for the Credo subscription business to be my sole area of income (I still supplement it with consulting as I don’t have investors or anyone that is demanding faster growth) this is extremely important. While 2017 will definitely see rising costs as I may bring on my first full-time employee and I’ll be investing more in building out the full platform, the goal is to keep expenses under control. As you can see, the first part of the year business revenue was almost all consulting and commissions. If you look a bit closer, you can also see that commission revenue declined from a high of $4,520 in December to a low of $2,925 in April with the switch to Credo being a subscription product happening in May. Subscription revenue looks to have grown in fits and starts, but really I shut off new subscribers on the platform for October and November while we traveled abroad and moved to Denver. Consulting, especially the digital strategy work I tend to do these days, is incredibly lucrative and consistent for me. I have often said to those close to me that if I was just after making a ton of money in the short term, I’d just be consulting full time. I definitely have friends who do that who make quite a bit more than me. However I purposefully decided to not build a marketing agency in favor of building an asset like Credo. I’m keeping this revenue section purposefully short because it’s not the best measure of a successful year. While I’ve been incredibly fortunate in 2016 to have done well in business, I believe that the minute we start tying “success” to the ebb and flow in business is the same minute that we start focusing on the wrong things and longterm will not succeed. So while revenue matters, especially as a bootstrapped entrepreneur, it is far from the most important thing that has happened to me in 2016. I am quite excited for 2017. While 2016 has been quite the rollercoaster personally and professionally, at the end I feel much more stable both personally and professionally than I have in quite some time. We have big plans for 2017 (likely buying our first home among them) and I can’t wait to see what the year has in store, both the successes and the challenges. I have big goals for revenue growth for Credo as well, and as of a couple weeks ago I finally have enough data to understand the metrics that drive my business and where I need to either plug holes or step on the accelerator a bit harder. $500k ARR ($41,666/mo) for the software subscription business by the end of the year, up from the current $140k ARR (~12k/mo). I am targeting consulting to add another $150k to this. Buy a home, which means saving a substantial amount of money for the down payment as well as finding and closing the right place. Flying my wife and I first class to a wedding in Senegal late in the year for free using only miles and rewards from credit cards. I’ve long wanted to go to Africa, so with this wedding it’s also my opportunity to figure out the churning mindset to get ridiculous flights and luxuries for cheap/nothing. Speaking at a few big conferences in the US again and doing my first overseas talk. In years past I’ve had multiple opportunities to speak in Brazil and Turkey, but none of them worked out for various reasons. 2017 will be the year. Note: this post may contain affiliate links, which means that if you click the link and buy a product I will receive a small commission. However, I never link anything via an affiliate link that I do not personally use and vouch for. More about my advertising policy here.